The Archaeologists for Autism mission is to unlock the potential of children with developmental disabilities. We aim to provide children with autism spectrum disorders and their families a chance to experience archaeology in a fun, low stress environment. 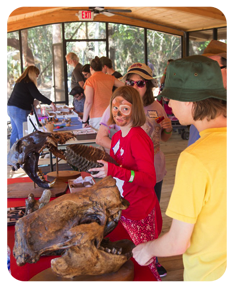 At our Archeologists for Autism event, children on the autism spectrum and their families will be walking the grounds of an actual archaeological site and be able to enjoy a wide range of activities related to archaeology and paleontology, live music, face-painting, and much more. Participants will be able to use social skills, and use various functional skills, all while having fun! The entire event is FREE. 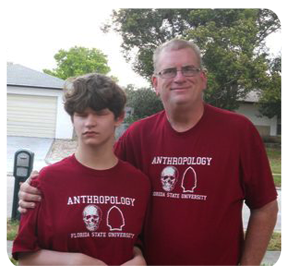 What: The Archaeologists for Autism mission is to unlock the potential of children with developmental disabilities. We aim to provide children with autism spectrum disorders and their families a chance to experience archaeology in a fun, low stress environment. At our Archeologists for Autism event, children on the autism spectrum and their families will be walking the grounds of an actual archaeological site and be able to enjoy a wide range of activities related to archaeology and paleontology, live music, face-painting, and much more. Participants will be able to use social skills, and use various functional skills, all while having fun! A list of some of our activities can be found on our website. Founder Tom Penders with his daughter Becky. Who: Children on the autism spectrum ages 5 to 17 years and young adults on the spectrum ages 18 to 22 who are enrolled in public school or equivalent. We are not just looking for monetary donations. Please review our list. We are in need of equipment, educational materials, goodie bag items, replica fossils and real unprovenenced megafauna/Pleistocene fossils, replica and real unprovenenced artifacts, broken replicated pots, etc. Your donation of equipment and supplies may be tax deductible. Please check with your tax professional. I am happy to present to you the new Archaeologists for Autism logo. We have a more mature and professional design. The logo was cretaed and donated to us. This is now the official look for AFA. The autism puzzle pieces symbolize the mystery and complexity of Autism Spectrum Disorder. Those puzzle pieces have been modified to reflect a pot that an archaeologist might recreate from sherds found at a site. Until the pot is reassembled it is a mystery as to its shape and function. In both cases, we try to reassemble the pieces to have a better understanding. The red-blue-green-yellow colors associated with the autism puzzle pieces have been changed to an earthier version of these colors and might more correctly represent the color palettes that are present in an archaeologist's world.